Kyle Meyer, Ph.D., demonstrating at last year's event. This year, Dr. Meyer will demonstrate additional modules, alongside 14 faculty and student teams. The E-Learning Program's next Innovators in Education Showcase will be held April 16 in the Center for Nursing Science lobby. The event, which runs from 10:30 a.m. to 1:30 p.m., is open to all UNMC faculty, staff and students. The showcase will highlight the most recent projects funded through the Office of Academic Affairs and feature teams from all UNMC colleges. During the showcase, attendees are invited to meet the faculty and student developers and see live demonstrations of the projects. "We are always excited to share the innovations of our student and faculty teams. We hope that attendees will be inspired by the quality and creativity of the modules to incorporate more e-learning into their own curriculum," said Peggy Moore, director of e-Learning. 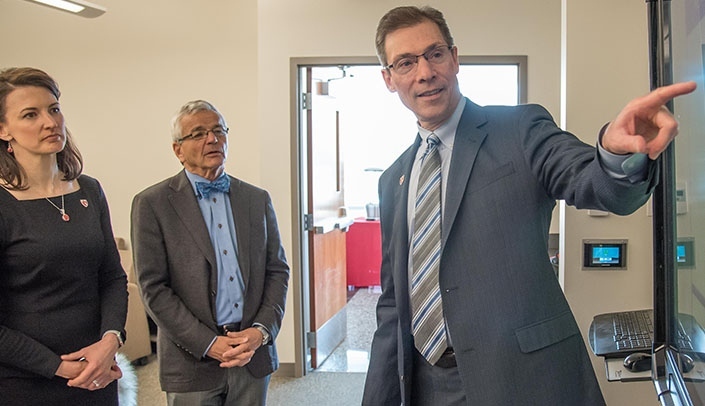 "Additionally, we are thrilled to have College of Allied Health Professions Dean Kyle Meyer, Ph.D., back demonstrating the final and expanded version of his health care reform e-module." Three faculty from the last cohort will present their preliminary e-module study data at the recognition ceremony. The faculty worked closely with the Interprofessional Academy of Educators and the UNMC Department of Biostatistics to develop educational research plans. The E-Learning Program also will host the "Pecha Kucha Ignite" on April 16 at 9:30 a.m. in the Sorrell Center, Room 4053. A panel of experts from Elsevier, UNMC and more will participate in a fast-paced panel presentation focused on emerging trends in instructional technology and online learning. To learn more about all the events, contact the E-Learning Program.